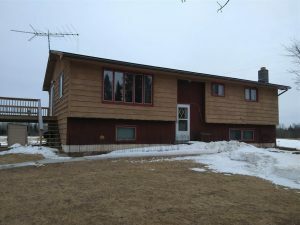 A beautiful home situated on 40 acres just south of Hibbing! This split level house has everything you could want — including a walk-out basement! 4 full bedrooms; 2 3/4 bathrooms (1 on each level); open and spacious living room/dining room/kitchen; bonus room on main level (previously used as a crafts room); large den/rec room on lower level; and a mud/laundry room as you enter the walk-out basement door. Home is primarily heated with an outdoor wood burning stove — perfect for country living on 40 acres; electric heating system serves as backup/additional heat. This property has a large 2+ stall garage, along with a barn and extra storage building.